For episode 24, Geoff Moes (@ThallidTosser on Twitter), Nat Moes (@GrandpaBelcher), Josh Chapple (@joshchapple), and Andy “Brass Man” Probasco ()@tmdbrassman look at some recent Vintage Magic: The Gathering results, namely the recent MTGO Power 9 Challenge, and the Team Serious Open. It’s one of our longest episodes ever, and we have lots of detail and discussions of the decks, and their relation to the Vintage metagame. Now that Vintage is available through MTGO, there are sizeable events online. It’s a reasonable way to look at what’s going on in the format. More than looking at a 20-player online or offline event, anyway. The results from the January 20 MTGO Power 9 Challenge (with 100 players!) are here, and we look at the top 16 decks. While TheManaDrain.com is being refurbished by the capable hands of our own Brass Man, the decklists from the Team Serious Open are unavailable (we’ll update this post when they are up). The two we talk about most are below, featuring Dragons and more Dragons! I’ll note here (as I believe I did in the audio as well) that I lose regularly to Thundermaw Hellkite in testing. We also talk about the most recent slate of Vintage Super League decks. Information for them can be found through that website. Seriously, though, what’s up with those sideboarded Moxes? We wrap up by talking about some of our favorite pizza places. – Jet’s Pizza – Detroit-style crusty pizza available in the Midwest. It’s really good. And they made heart-shaped pizza’s for Valentine’s Day. – Via 313 – Detroit-style pizza that Josh had in Texas. Balsamic reduction, man. – Bennie Blanco’s – A late-night slice in Denver that Josh enjoys. – Pizza Papalis – Geoff’s favorite place in Toledo also in Michigan. He’s never had the Chicago-style there. – Harvest Pizzeria – Nat’s favorite place in Columbus. Try the Spicy Yuma! – Ernesto’s Old World Pizza – After Brass Man said there was no good pizza in Boston, he remembered this place and raved about it. Get it by the slice. – Antonio’s Pizzas – Brass Man also likes this by-the-slice place in Providence, Rhode Island. – Frank’s Pizza and Grill – This is the giant calzone-style stuffed pizza place in Maryland that Nat couldn’t remember. As you can see from the list, we like pizza. Who doesn’t like pizza? The Serious Vintage Podcast and Team Serious tournament streaming activities are done with love for the Vintage format and the community surrounding it. Until February 23 (one more day!) we’re running a Teespring fundraiser campaign to raise money to improve podcasting and streaming technology (better mics, software, cameras and setup). You can help by ordering a shirt and showing your love for what we do. Several colors and sizes are available, including hoodies! Thanks to everyone who has already ordered and helped us out. Together we’ll cast some love, targeting the Vintage format! Thanks for listening! We hope to do more regular podcasting in 2015. We look forward to any questions or comments here or on Twitter. 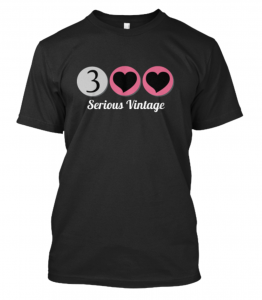 You can also email us at seriousvintagepodcast@gmail.com. Serious Vintage Episode 25: How Bad Are We?